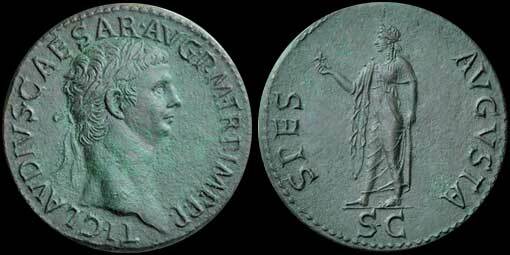 Sestercius 50-54, AE 29.97 g. TICLAVDIVS CAESAR AVG P P TR P IMP P P Laurete head r. Rev. SPES - AVGUSTA Spes, draped, advancing l., holding flower in upraised r. hand and raising skirt with l., in exergue. SC. C85. BMC 192. RIC 115. CBN 216.